A sick man who sneaked out of the hospital he was admitted in to drink beer which he says might be his last, has gone viral with his Facebook post after it was learnt that he was diagnosed of heart cancer. Mr. Derrick Tembo from Ndola, Zambia who was told he doesn’t have much time left by doctors, reportedly has an incurable cancer. 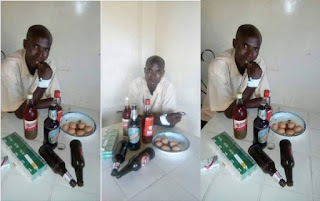 The sick man who sneaked out of the hospital to drink beer without anybody noticing, stated that his days are numbered and he believes the beer he drank might be his last.